In this massive biography of Colonel Edward Lansdale, biographer Max Boot has given us the story of a quiet American who was not the quiet American. Graham Greene’s 1955 novel, The Quiet American, has often been presumed to have been based on Lansdale, who was an American CIA operative in the Philippines and later in Indochina. The novel has also been presumed by many to be an essentially anti-American tale. Boot is certainly in that camp. If Boot takes exception to Greene’s take on America, he also takes exception to the notion that Greene borrowed Lansdale for his main character. His reasoning is twofold. One explanation requires a single sentence; the other occupies over six hundred pages. The simple fact of the matter is that Greene was in Saigon and its surroundings in the early 1950s, and finished his novel before Edward Lansdale first arrived there in 1956. To be sure, Lansdale had made something of a name for himself in the Philippines prior to 1956, but not so that even a well-established English novelist would have known of him. And that takes care of that. The larger problem—and discrepancy—takes somewhat longer to explain—and reflect upon. True, Greene’s main character, Thomas Fowler, was a CIA operative in pre-Diem French Indochina. He was also an American innocent determined to organize a Vietnamese “Third Force” between French colonialism and communism. His efforts, to put it mildly, ended in tragedy and disaster. Such are the consequences of American innocence. At least that was the conclusion of Graham Greene. By Boot’s estimate, the American war in Vietnam was not without its tragedies. Witness the book’s subtitle. Was it an inevitable tragedy? Boot does not pretend to know. But he does want to suggest that the result might have been very different had Lansdale been in charge or his advice at least seriously heeded. Why else would he be worth such extended treatment? Of course, Colonel Lansdale was not in charge. Nor was he often listened to by those who were. Boot thinks he should have been listened to then, and that he has something to say to us now. In the first place, Boot argues, the good colonel was a fascinating character. Secondly, this country is still wrestling with the American war that was in Vietnam. Therefore, the American war that might not have been (had Lansdale had his way) should readily command our attention. Lansdale was an unconventional CIA type in many, many ways. Born in 1908, he was reared mainly in California (and later in Detroit). A college boy (UCLA, where he made a minor name for himself as a cartoonist), he married a woman seven years his senior in 1933 and proceeded to work in the advertising industry for the rest of the Great Depression. After Pearl Harbor and the American entry into World War II, Lansdale was determined to do his part. This led circuitously to a stint in the OSS, which in turn became his springboard to the CIA. Although he neither trained for nor anticipated such a career, he never really left government service once he set out on that path. Two more “nevers” are crucial here. Lansdale was never an American spy, and he was never an American innocent. What he was, more than anything else, was an American who was drawn to and fascinated by the Far East. In some, but not all, respects Boot is correct to see Lansdale as something on the order of an American version of T. E. Lawrence. But Boot is also right not to push the Lawrence-Lansdale connection too far. T. E. Lawrence became Lawrence of Arabia, or at least fancied himself as such. Lansdale did not become Lansdale of Indochina. Nor did he see himself as that. Peter O’Toole can rest safely in his grave. Instead, Lansdale was—and remained—an American, an American cold warrior and an American patriot. His involvement in the Cold War centered on the Philippines, where he had some success, as well as Cuba and Indochina, where he did not. In both the Philippines and Vietnam Lansdale saw his role as essentially threefold. Despite his lack of facilities with foreign languages, he was determined to learn as much as he could about local conditions, including the locals themselves, meaning leaders, would-be leaders, and ordinary folk. He then sought to make that knowledge available to official Washington. Finally, he engaged in “friendly persuasion” to assist the locals in fighting their own wars against communist insurrections. There was nothing naïve or innocent about his efforts. There was little that was underhanded. He did what he could to separate leaders from would-be leaders, as well as to distinguish the corrupt from the uncorrupt. There was no search for a mythical “third force.” Yes, there was a non-cynical effort to win the “hearts and minds” of the local population in the name of combatting the Huk rebellion in the Philippines and the Viet Cong and North Vietnamese forces in what would become South Vietnam. His efforts in the Philippines were initially successful. A charismatic leader, Ramon Magsaysay, rose to power with not a little American help. The Huks lacked any significant outside support for their efforts, and there was no immediate European colonial past to complicate matters. Unfortunately, Magsaysay was killed in a plane crash in 1957. His successors have not always been models of anti-corrupt, much less uncorrupt, democracy builders. But Lansdale’s efforts there largely deserve the praise that Boot gives them. Vietnam proved to be a very different story. There the “road not taken” was the road that he had pursued in the Philippines. But Vietnam was not the Philippines. President Ngo Dinh Diem was not President Magsayay. A shy, bookish man, Diem was given to long-winded private monologues rather than public displays of concern for and encouragement of his people. In addition, Vietnam was the scene of a century of just-ended French rule, not to mention a continuing French presence. There was also the presence of a genuinely charismatic figure in the north, Ho Chi Minh, not to mention his genuinely powerful and well-led army. Lastly, Ho had communist allies outside of Vietnam. In the south there was also the not-so-small matter of Buddhist opposition and other anti-Diem sects, as well as high levels of corruption in the country generally. Finally, neither John Kennedy nor Lyndon Johnson was Dwight Eisenhower. The book actually begins with the overthrow and assassination of Diem on November 1, 1963. In Boot’s estimation the chief villain of this piece was American Ambassador Henry Cabot Lodge, who had been appointed by Kennedy for bipartisan reasons and who would not be challenged by Kennedy for the same reasons. But both JFK and RFK, as well as Kennedy subordinates Robert McNamara and Maxwell Taylor among many, many others come in for their share of criticism as well. In any case, the removal of Diem set America on the road that was taken. The rest is history—and tragedy. Of course, no one can know what might have happened—or not happened—had Lansdale been heeded. It’s safe to say that Diem would not have been removed. But would he have prevailed, as Magsaysay did prevail, without extensive American military support, including large numbers of American troops? Lansdale thought that Diem at least had a fighting chance. He also thought that Diem was America’s best bet. Boot has given us a highly detailed and quite compelling account of the private life and public career of Colonel Lansdale. The picture that emerges is one of a good, but seriously flawed, man. While playing his role in the Cold War, Lansdale had a wife and two young sons in Washington, DC. He also had a mistress in the Philippines, a Filipino who was the love of his life and whom he would marry shortly after his wife’s death in 1973. To what extent was his preoccupation with the Orient a matter of his private pursuits and to what extent was it a matter of his pursuit of public policy? Boot properly does not pretend to provide an answer. But the question is an important one. Lansdale, of all people, should have been quite aware of the difficulties of transporting his Filipino strategy and success to Vietnam. And if he went out of his way, as he did, to ingratiate himself with the South Vietnamese, he also went out of his way to antagonize American officials. This member of the American bureaucracy was the ultimate anti-bureaucrat. 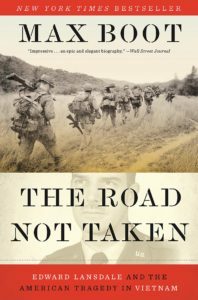 A freelancer, if not quite a rebel, at heart, Lansdale made more than his share of American enemies, both in Vietnam and in Washington. Lest we forget about Cuba, Lansdale, despite his public denials, was part of Operation Mongoose, code name for the Kennedy administration effort to assassinate Fidel Castro. Running through this biography is Boot’s commentary on four American presidents and their handling of American foreign policy: Eisenhower, Kennedy, Johnson, and Nixon. Only Ike earns high marks, both for his willingness to prosecute the Cold War in clandestine, as well as Lansdalian, fashion, and for his reluctance to put large numbers of American troops in harm’s way. JFK might have turned out to be another Eisenhower. But any chance of that happening ended in Vietnam with the Diem assassination. He still might have become a Lansdale patron of sorts had he not been killed three weeks later. But with LBJ in the saddle, the good colonel would be left in the dust. Robert McNamara was chief among those who would see to that. If Lansdale did have an ally in the Johnson administration, it was Vice-President Hubert Humphrey. But when it came to policymaking on Vietnam, Humphrey was kept on the outside looking in. Johnson, all by himself, saw to that. Lansdale was not really a tragic figure, in the way Boot sometimes suggests. He was simply an engaged, sober-minded, sometimes sardonic, sometimes puckish, sometimes driven, sometimes ingenious cold warrior. He tried to be an apolitical American patriot. But at his core, he was quite conflicted, both personally and professionally, between differing loyalties: wife and mistress, or his American superiors and Vietnamese clients. His story nonetheless remains an important one, as we continue to ponder not just the lessons of Vietnam, but the role and place of future Lansdales and Lansdale-like operations in the twenty-first century. Or has his day come and gone with the end of the Cold War? Maybe the hearts and minds that are now most in need of being won over live right here in the good ol’ conflicted USA. John C. “Chuck” Chalberg writes from Minnesota.